Online shops give customers the convenience of being able to do their shopping when it best suits them, without the need to travel somewhere at a certain time of day. They can allow more customers to hear about you and potentially buy from you. 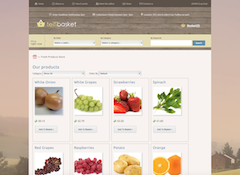 The Basket software allows you to set up and manage your own e-commerce website. When you set up the Basket, you can decide whether you want your site to act as a single shop, or a marketplace, which hosts multiple shops that can each be managed by their own shop owners. The marketplace links all the sellers in your site together, allowing customers to shop across multiple stores using a single shopping basket. When a customer buys from multiple sellers, the payment is split appropriately between those sellers, and customers are emailed a confirmation of purchase. This tool is suitable for anyone who wants to create an online shop, from an individual seller's website to a community website of local traders and sellers in the area. 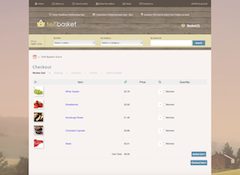 Try out our demo – browse between the shops and categories, add items to your basket and check out. Dummy shops and Paypal Sandbox are used in this demo so no real money is taken. 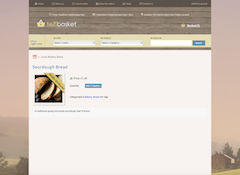 If you'd like to see what the system is like from a seller's point of view, you can try the demo account - log in with the username localbakery and password test. A. Crabtree, A. Chamberlain, “Making IT “Pay a Bit Better”- Design Challenges for Micro Rural Enterprise” In Proceedings of CSCW 2014 (pages 687–696), Baltimore, February 2014.